The tomb of the general Eremia Grigorescu – Marasesti Monument. Among the most important monuments in Europe, The First World War Heros Mausoleum from Marasesti distinguishes itself as well. 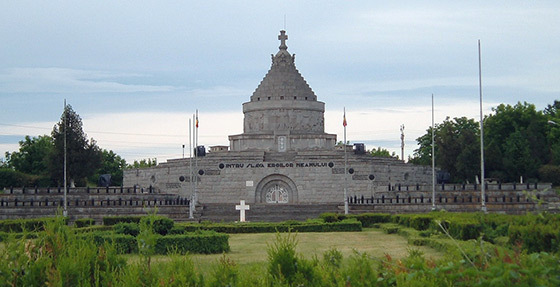 It is a monument built in the memory of those who fought during The First World War, when, although inferior numerically to the German troops, the Romanian army succeeded in blocking the German attack. 480 Romanian military officers and more than 21000 Romanian soldiers paid the ultimate price for this victory. The soldiers that died that day were buried in landowner Ulise Negropontes’ vineyards, and later, in 1924, they were inhumed again in the crypts of the future monument, under Queen Maria’s watch. 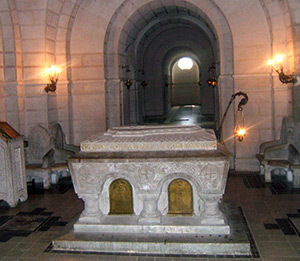 5073 soldiers and military officers are buried in 163 crypts (154 individual crypts and 9 common crypts), crypts that are situated in 18 corridors. Built between 1923 and 1938, 35 km away from Focsani, the majestic mausoleum was realized according to the architects George Cristinel’s and Constantin Pomponiu’s plans (they were the winners of the projects competition and were offered gold in the value of 400000 lei) and at 18th September, 1938, the mausoleum was officially inaugurated. With this occasion, a jubilee medal was sent forth, medal that had a diameter of 60mm, carved in three different ways: gold, silver and bronze and on the reverse side, in the middle, one may see the Hero’s Mausoleum from Marasesti. 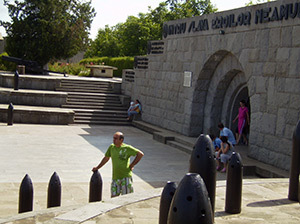 Marasesti Monument – First World War Heros Mausoleum. “ Pe aici nu se trece” (“This way one shall not pass!”) said then general Eremia Grigorescu, the commandant of the Romanian First Army. As a sign of gratitude, he received afterwards the most important decorations and a samurai sword, on which the words: “ This way one shall not pass!” were carved. The building of the mausoleum was moved off at 28th September 1924, in the presence of many personalities of that time (Queen Maria and others) and was resumed 12 years later in 1936. 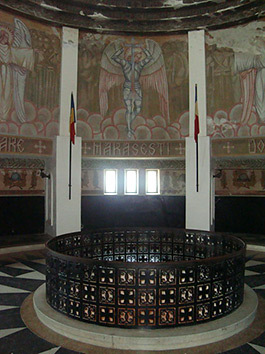 The bas-reliefs from the Glory Dome were realized by Cornel Medrea and Ion Jalea and reveal various moments of the war from Marasesti, the inner painting being done by Eduard Saulescu. Few know that, at the beginning, the mausoleum was supposed to be a Church of the Nation, the working being canceled because of the lack of money. Everything started after the Union in 1918 when, the Princess Alexandra Grigore Cantacuzino , IPPS Pimen and the Metropolitan of Moldavia and Suceava decided that a Church of the Nation should be built there, in the exact spot where so many heroes had given their life during the war. The same year, this idea was dropped off and the subscription lists were released, the mausoleum being built through the public subscription. Having a patriotic spirit, Ulise Negropontes himself donated money for the building of the mausoleum (20 hectares of native vineyards and gold in the value of 50000lei). 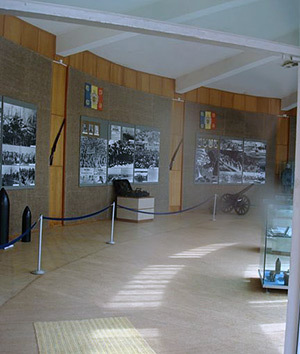 The museum of the Marasesti Monument – First World War Heros Mausoleum. 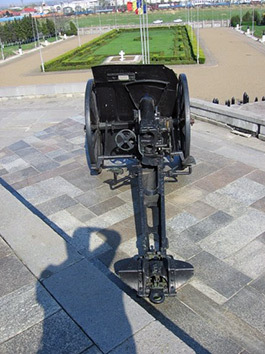 It is said that The Mausoleum from Marasesti caught even Adolph Hitler’s attention, because he asked marshal Antonescu to send at Marasesti two anti-aircraft subunits to defend the monument, while Prahova Valley was attacked by the allies’ aircraft and Moldavia was threatened as well. The Mausoleum from Marasesti is a massive building in the shape of a pyramid, the stairs having an irregular octagonal form. The base area is 1600 square meters. The superior side is round, almost like a tower, and it’s 30 meters tall. 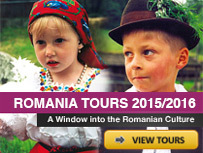 The touristic potential is over 50000 visitors per year, the visiting programme starts at 9 am and ends at 7pm, daily. The mausoleum is situated in Vrancea District, the access towards it is possible by following the road DN2 Bucharest-Focsani-Suceava. God bless you too ! Thank You !